Micromax is providing value for money when it comes to smartphones with competitors like Lava and iBall in the market. The Micromax Bolt D321is yet another example of it. What this phone is offering, is very basic and sufficient for everyday use. Let’s take a look at the Micromax Bolt D321 specifications. The 5-inch phone comes with a 5MP rear camera and a 0.3MP front camera. Both these cameras are average but can be used to take occasional pictures. The internal storage is merely 4GB out of which some is consumed by the apps. Thankfully it is expandable via microSD card slot. Coming to the battery, the phone houses a 1800mAh capacity battery. The battery serves non-stop for a good couple of hours. One can reach for this phone if the usage is limited to calling, texting and web browsing. Under the INR 6000 category, this is good enough. 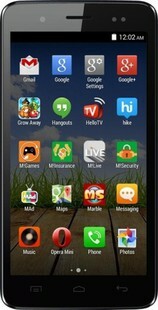 Micromax Bolt D321 price starts at INR 5499. Micromax Bolt D321 full specs and reviews as of Apr 2019. Buy it here!